States hold a fundamental responsibility for the provision of security as a common good, which co-exists with our expectation that they will also protect the polity in a broader sense: preserving liberty, enhancing democracy, protecting rights, aiding social cohesion, providing a baseline of social and economic stability and so on. These multiple functions are sometimes placed in tension with one another by the requirements, or perceived requirements, of security. My research explores these tensions in three main ways: (i) by exploring the resilience of human rights in the face of counter-terrorism, (ii) by interrogating the societal and legal implications of counter-terrorism and how we can understand and take account of these, and (iii) by exploring the nature of the contemporary counter-terrorist state and its implications for constitutionalism. Human rights undoubtedly come under strain in the context of counter-terrorism. This arises from the nature of what states perceive to be necessary security activity as well as from states’ attempts to reshape the legal limitations under which they operate in order to facilitate such activity. 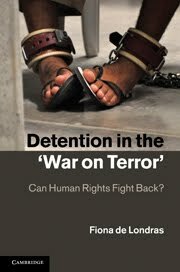 In my 2011 book Detention in the War on Terror: Can Human Rights Fight Back? 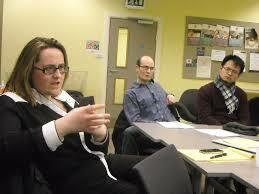 (CUP) I argued that we can observe both external and internal challenges to human rights since 2001. External challenges–such as that of the US–relate to the very applicability of international human rights standards; Internal challenges–such as that of the UK–accept the applicability of human rights but argue for their recalibration in the face of the nature of ‘new’ and ‘grave’ terroristic threats. This raises questions about how we can build resilience in human rights; questions that I have often answered by placing faith in the judiciary in the face of what appears to be political inability or unwillingness to stand up for rights. Increasingly, however, I call for a collaborative approach including but not limited to what I term judicial muscularity. My most recent work on this, approaching the matter largely through a ‘judicial review’ lens, proposes a concept of ‘regulatory constitutionalism’ and is published in Davis & de Londras (eds), Critical Debates on Counter-Terrorism Judicial Review which was published by CUP in late 2014. My chapter, “Counter-Terrorist Judicial Review as Regulatory Constitutionalism”, can be accessed on Durham Research Online. 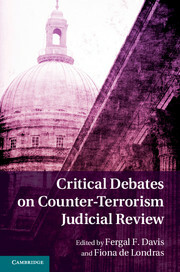 The book opens with a long introductory chapter, coauthored with Davis, entitled “Counter-Terrorist Judicial Review: Beyond Dichotomies”, which can also be read on DRO. In a recently-completed project I led an international and inter-disciplinary team considering the implications of counter-terrorism for law and society through the prism of three governing ideas: impact, legitimacy and effectiveness. This work took place within the context of an FP7 funded project entitled SECILE which I led in Durham. 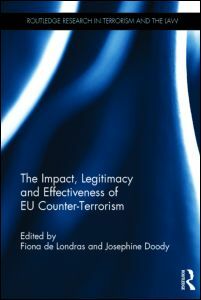 The project ran from May 2013-November 2014, and has now culminated in a major edited collection published by Routledge (de Londras & Doody (eds), The Impact, Legitimacy and Effectiveness of EU Counter-Terrorism (2015)). You can also access the project deliverables without charge here. My chapter in the collection is entitled “Governance Gaps in EU counter terrorism: implications for democracy and constitutionalism”. In it I argue that the making and implementation of EU counter-terrorism raises serious questions as to the extent to which this limb of the Union’s activities is undertaken in accordance with the constitutionalist spirit of the Union and, if not, what implications this may have for constitutionalism and legitimacy within the EU. Although some of these concerns have been doctrinally (if not yet practically) resolved through the dissolution of the three pillars and further empowerment of the European Parliament in the Lisbon Treaty, a number of fundamental concerns persist. The chapter starts by outlining the scope of the EU’s counter-terrorism activities since 2001, before going on to consider the paper’s framing concepts of constitutionalism and legitimacy. Building on this, the paper then assess EU counter-terrorism by reference to provenance, process, democratic oversight and effectiveness in order to consider the extent to which EU constitutionalism may be compromised or called into question in the field of counter-terrorism as so far engaged with by the Union. I argue that the EU experiences constitutionalist tensions in the making and implementation of counter-terrorism law and policy, some of which are resolved by the courts of the EU, but the nature of which point to the need to build further constitutionalist structures into EU counter-terrorism. Much of my current work focuses on understanding, mapping and critiquing the contemporary counter-terrorist state which I characterise as being transnational, privatised, securitising and secretive. This poses clear questions for our ability to ensure a constitutionalist state in which power is limited, transparent and accountable. Proposing meaningful solutions for the maintenance of constitutionalism requires one to grapple not only with the limitations of law but also the practical and pragmatic realities of (coutner)terrorism, including secrecy and the nature of transparency in a counter-terrorist context. My work on this is ongoing and will culminate in a new book to be published by CUP. Fiona de Londras (2012), ‘Closing Guantánamo Bay: The Triumph of Politics over Law?’  Public Law 18-26. Fiona de Londras & Suzanne Kingston (2010) ‘Rights, Security and Conflicting International Obligations: Exploring Inter-Jurisdictional Judicial Dialogues in Europe‘. American Journal of Comparative Law, 58 (2):359-413 (extracted in Sudha Setty (ed), Constitutions, Security and the Rule of Law (2014, London, New York and Amsterdam; iDebate Press, 123-139). Fiona de Londras (2007) ‘In the Shadow of Hamdan v Rumsfeld: Habeas Corpus Rights of Guantánamo Bay Detainees’ Irish Criminal Law Journal, 17 (2):8-16.